Cabin Conversion for the kids! Enjoy the Fully Stocked Bar! End of a Perfect Day on Nenne! Apple TV in every cabin and saloon connected to satellite system. Music system is available in every cabin, saloon, cockpit and flybridge connected to a film and music server with wide range of content. Wine cooler and trash compactor. Extra fridges and freezers and high volume ice maker. NENNE´s crew of three is a dynamic and welcoming team who instantly help you feel relaxed and right at home. Donald and Audrey, married for 20 years, met in South Africa and have spent the last 8 years sailing in the Caribbean. Their great sense of humor, excellent hosting skills and vibrant zest for life promises to make your vacation an unforgettable experience. *Only one rate reduction can apply, not valid for Christmas or New Year’s charters. Send us an inquiry to get specific pricing for Nenne. 24 Feb - 2nd March, 2019 – An Experience of a Lifetime! Thank you for the most incredible setting for the most incredible week. You really took our vacation to the next level with 5 Star cuisine, 5 Star service and 6 Star anecdotes & jokes. Thanks for making life on the water look effortless, while we know you’re all paddling like ducks underneath. You welcomed us and our best friends into your live and became people we want to have in our lives more. So, we’ve promised our kids to come back – can’t wait for you guys to meet Vince Jr. (x3!). Thank you, thank you, thank you for an experience of a lifetime. We can’t imagine spending it with any other crew. From Donald’s hilarious tales and jokes and Audrey’s delicious meals and Dennis’s helpful hands – our hears and tummies and glasses were always full. You made us feel like family! We are so happy and grateful that we got to share this wonderful adventure with you. We hope to return one day and be repeat guests. We want to thank you for the amazing hospitality! You crushed it! From the fabulous gourmet food, to the hilarious commentary. It was truly a pleasure. Donald, you have found your calling. You all made it appear effortless. A special shout out to Dennis for his excellent personalized service. Thank you seems like too small a word to express how grateful we are to have spent this week aboard the Nenne. You kept us smiling and laughing with full bellies and full glasses of pinot grigio! Good luck Dennis on you next boating adventure! Sad to be leaving but heading out with a huge smile on my face and a very happy heart! I am full of gratitude from the week on Nenne with you! Memories for a lifetime. Chop Chop…Time to go home. Yes, Yes, Yes we will be back! Wow, what a great week! Thank you for all of the great memories, consistent humor, great food and knowledge of the area. We can’t wait to come back!! Thank you for an amazing week of wit, humor and keeping us laughing. We appreciate all your amazing food. It was a true adventure! 10-17 February, 2019 – BVIs – A Fabulous Week in Paradise! Thank you all for an amazing week in the BVIs! Y’all are the best crew all around and I cannot imagine every coming back to the BVIs without you. From the jokes, cooking, conversation and service you make the trip everything I dreamed it would be. Thanks again and I look forward to our next trip! Y’all out did yourselves! From the stories, adventures, meals & friendship our 2nd trip was amazing. Thank you for taking the time to get to know us and making the Nenne our home for the week. Thank you for such a wonderful charter trip, especially for my first trip to the BVI! You two are such a good team, entertaining us, cooking the most delicious meals (I will email you for recipes! ), and keeping us safe as we traveled the beautiful waters. Not sure anything can top this charter (or any other captains!!). You made us feel so welcome and supplied us with endless hilarious stories. We can’t wait to plan another trip with you all. And Dennis has been trained so well, we enjoyed his level of service and always smiling face! We can’t thank you enough for another fabulous week in paradise! It is hard to put into words how amazing the Nenne crew is. After the hurricanes we were nervous the BVIs would never be what they used to be, but it is obvious they are more than on their way! Good luck with your new adventures in the Bahamas, we already cannot wait to plan our next trip…and who knows…maybe will our “littles”. Thank you again for everything! If you ever feel like coming to Charlotte or Canada, you have a place to stay. Dennis, best of luck in the future, we can’t thank you enough for everything this week! We adored your super friendly always smiling willing to do anything personality and can only hope our children frow up to be as hard working and fun! Another epic week! Feeling very blessed to be part of this crew of travelers and part of the Nenne family. Too many amazing things to list, but a special shout out to Audrey for keeping us incredibly well fed. Good luck to Dennis on your super yacht adventures! Open invitation to Canada always! B – Business Time! Need we say more?! C – Captain Donald! Joke teller & storyteller – personality plus! D – Dennis! Polite, kind, respectful – impressive! I – Integrity of crew – best in the business! N – Nenne – What a vessel! O – Over the Top – It doesn’t get better than this! R – Rejuvenated – That’s us! 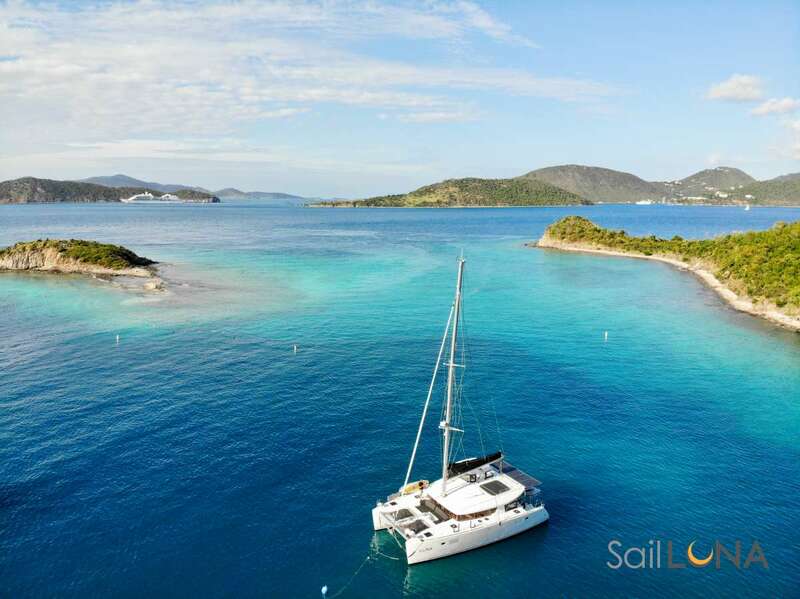 S – Snorkel, scuba, sailing, special life experiences! V – Vibrant – Personalities aboard this ship! X – Xtra-Xtra- This crew goes above and beyond! Z – Zzzzzz – Some of the blest sleep on the best bedding! 6-12 January, 2019 in the BVIs - Unforgettable! Thanks for the Happy Birthday Celebration. Didn’t know if it referred to last or this year’s birthday. Not important…I got to celebrate twice thanks to you. Love you. Se you in the PR soon. You will always be in my heart and my prayer, we have a wonderful time, every day was special, you have entertained us and kept with us, I will never forget this wonderful trip, ever. You guys are a perfect example of what should be a crew on a boat. Remember if you contact us we will try to please you as well. Thank you so much! Speaking for all the professional drinkers in the world, thank you, thank you, thank you! Hope to see you soon! I just want to thank you all for the amazing week we just had. It has been a real “pleasure” to know you and travel this week around the BVIs. An amazing experience I will not forget. Wish you all the best, and thanks again for making everything perfect! Thank you for an unforgettable time! Your warmth made every day so special and not to mention, the tastes, the sights and laughs that we will treasure always. Pleasure, Pleasure, Pleasure! 27 Dec - 3 Jan 2019, New Year Charter – An incredible Week! Note from broker: The family were very happy, had a great time. What a sad day it is! This has been the most special week celebrating the end of one year and the start of a new one, snorkeling and diving, sailing to beautiful Anegada plus the delicious food and drinks. We have enjoyed every second! Thank you for making the boat the perfect place for our 8 month old baby, who I know will be a captain and master diver after this trip. I think he has better sea legs than all of us. Good luck to Dennis, a real fish! Keep us posted on your endeavors, we can’t wait o hear of your next adventures! Thank you for making family gathering so special! From the start you made each experience flow with ease even when the odds were against us. The knowledge you each bring to the table is priceless and the grace you express through your hospitality is 5 star! Happy New Year! May you years ahead be filled with abundance. We can’t thank you enough for making this past week so incredible. Anna and I had a blast sailing, snorkeling and diving with you. Audrey: Your meals were incredible, and I believe you taught us some new tricks that we’ll use going forward (e.g. bacon roses). Also, thank you SO much for organizing our open water certification, our dive on the Rhone is something we’ll never forget. Donald: Thank you for the many hours of great conversations, jokes and card tricks. If you find the time, best of luck with the hang gliding in the nearby area! Dennis: Thank you for all of your help in organizing all of our water activities and mixing our cocktails. We wish you all the best with you future sailing endeavors, and fingers crossed, everything works out with the Black Pearl! You all are a truly wonderful crew! Thank you so much for such a phenomenal time! We hop you’ll continue to live life to the fullest and have the best time! Also, Dennis: Thank you for all the delicious drinks! Only six months later and here we are again! And, we got to celebrate our birthdays together! Thank you for showing us a new corner of the world. Once again everything was perfect – the food, the drinks and especially the company! 14-22 June, 2018 – An Unbelievable Family Experience!! Where to begin? A fabulous boat, fantastic crew, outstanding meals & constant cocktails! But those are the obvious, what was so fantastic was the warmth & humor, knowledge and friendship that we so quickly shared. It was an unbelievable family experience celebrating Chris’s 70th, and we will never forget this past week. You have all made it very special for us. All the girls and Jack had such special moments – boom jumping, tubing, learning magic tricks – and we adults enjoyed the sailing, stories and special cocktails. In a nutshell, we had a wonderful week and can’t thank you enough. Hopefully we’ll be able to join you all again, as it was truly a pleasure! Well, she said it all! I thank you so much for a fantastic trip. I couldn’t have said it better than Nana. Thank you for the amazing meals, fun activities (like tubing and of course boom jumping) and just an all around awesome time! Thank you guys so much! First off, I am so grateful that you were so kind and always shining smiles in my morning. Second, the amount of food, drinks and many other things you guys made/brought for us is definitely more than we deserved so thank you for that. Audrey, I am an extremely picky eater, and let me tell you that you made some of the best food I have ever eaten! Thank you for you nonstop work and glowing personality. I am forever grateful! Donald, you handle everything with such grace and we will always remember the “Amazing Captain Donald” who was the most fun guy ever! Thank you so, so much!! Dennis, I am so grateful for you. Not just the fact that you were always getting me things, you were so, so kind and I know the kids looked up to you. I cannot begin to say how grateful I am for you and your professionalism. You made this trip so fun and it was incredible to see the way each family member was entertained constantly. Truly an unforgettable experience! Thank you! Thank you for a truly amazing week. We loved every minute of it and can’t wait to come back again. And a special “thank you” for accommodating the food requests. The kids enjoyed all of it, which is impressive coming from the picky one. Of course, we all enjoyed every meal and the constant stream of cocktails as well. We were lucky to have you all as our crew. We couldn’t have aske for a more professional, funny, caring, knowledgeable and fun group! You guys are all an amazing crew and it felt like y’all were simply an extension of our family. Thank you for welcoming our family into yours and into your home!! March 31 - 6 April, 2018 – 50th Jubilee for Christo! Thank you very much for the awesome week aboard! I could not have asked for a better 50th. Great cruising, diving….excellent food and cocktails too! There are not enough stars to rate your attention to every detail of our week on the Nenne! Wonderful snorkels, sails, meals, cocktails, companionship, swims, entertainment, etc. A perfect family vacation for 3 generations! It was indeed a BIG DEAL. Thank you so much! I don’t think there is much more to say….the diving, food and cruising experience were perfect in every way. Saw the greatest full moon. Thank you! 17-24 March, 2018 ~ A Dream Come True! Thank you so much for making our 50th Anniversary the perfect week. So much to thank you for. Everyone loved it. You’re the best! Food was the best! Drinks and all the extras too numerous to mention. We loved this trip more than any we have ever taken! Thank you Audrey for all you do! Donald, you are unique! Never met a Captain who makes everything work so well. Audrey, thanks for the best food and thank you for making it all possible. Dennis, you are wonderful! We loved the “Nenne”. With love from all of us! P.S. I loved the stern ladders which worked so well for me! Thank you so much for a wonderful escape from the snow!! It was an amazing trip and I had so much fun here!! Lots of fun and the whole crew was amazing. Donald was very funny, and I will never forget you. Same with the other 2. The food was fantastic! Thank you! This week has been wonderful! Thank you so much for taking such good care of all of us on the beautiful Nenne. I know it could all be exceptional if you exceeded my expectations! Yes, they all are the best and we all had a ball! Thank you for the BEST trip I’ve ever had! Truly! Everyone was in a great mood for an entire week – you have no idea what an accomplishment that is! I love the boat and I was so lucky to have my own room. Donald – It is nice to meet someone almost as fabulous as I am. I’ve been all over the world and it is truly a feat! Thank you for making my children so happy. The three of us needed it. It’s been a rough year for us. Audrey – A more amazing feat is that Caroline loved every meal! That has never, ever happened. Please help me by sending your recipes. You have the funniest stories, and the best sound track! Dennis – You have done a great job. Thank you for being such a good role model. I can’t thank you enough! And I truly can’t express how much I needed the trip and how grateful I am for making my children so happy! And is white as a dove. The crew was awesome. I wish I could of helped, but you guys are better! They are all so nice and helpful and I hope to see you guys again. Thank you! P.S. Your food Audrey was awesome; Donald, you were so funny and Dennis you were very sweet and kind. Thank you for sharing and creating such an amazing experience. As other writers note, this crew is fantastic, due to the seemingly ease of doing your wonderful work. Thank you for all the adventures, activities, meals and attention this week. I will think of the BVIs and you all as I return back to the cold, rain and snow! This was the best experience I have ever had. I didn’t like the idea of living on a boat for a week, when I got here my mind just twisted around when I got on the boat. Mostly because you guys were helpful, sweet, kind, funny and so many other things. The service was amazing, and the food and adventures were all so, so, so, so amazing. This week has been a dream come true! Thank you so much for making an experience of my life. I appreciate everything you have done for me and my family this week. P.S. Thank you so much for teaching me to scuba dive Donald! Thank you for a phenomenal week aboard the Nenne, re-christened as the “Land & Proud Bateu Fernie La Bouche”. Thank you for teaching our girls to dive Donald. We couldn’t have asked for a better introduction. Audrey – Thank you for putting up with more chaos on a boat than is recommended. Your food was worth every simple calorie that we don’t have to count. Dennis - Stay cool and as you say, it has been a HUGE pleasure. You all have been fantastic, the island are stunning and look for us in the Unemployment Bay. 5-13 March, 2018 ~ One of the most incredible experiences ever! Donald: Best Captain – Best story teller – Best Joke Teller! You always kept an eye on us, always aware and always accommodating. Dennis: 3rd trip for the young lad – The hardest worker we’ve ever seen, he’s going to be the best captain for the future. Thank you for one of the most incredible experiences ever! Final Word: 5 stars all the way! Thank you all so much! Fabulous time! So many “scuuuzze me” moments. SCUUUZZZE ME!! This sums up the entire trip!! You made the trip for all of us! Donald, Audrey & Dennis crew made the trip magical. Thank you for putting up with our antics & special requests! You are friends for life – We’ll see you again soon! Clear Sailing & Pink Skies! We had a wonderful time aboard the Nenne. We shared wonderful memories and laughs together. Thank you for sharing your time with us and doing a great job of taking care of all of us! Had an excellent time with everyone onboard. Wonderful laughs & stories with Captain Don, Audrey & Dennis. Great to be alive @ 50 and celebrate the milestone birthday with friends. Food & Service nothing but First Class! 24 Feb - 2 March 2018 – From the G Family - Best Vacation Ever! We couldn’t have asked for better friends to celebrate a “60th” Birthday! Always showing up with a smile & a story. Audrey you always outdid yourself with each meal, the prep and hard work. Donald – Navigating & taking us on the best sites & excursions, card tricks and stories. Dennis “D money” adding a delightful sense of humor and style fitting right in with our crazy crew! You will go far in the world. You were all so patient & top notch accommodations. Adding the extra touches to make our holiday second to none. We hope to see you all again soon and please look us up in the states. Best vacation ever! Donald, Audrey and Dennis you are the best crew! We have had so much fun. So much good food. So many great stories. We have had so much fun and adventure. Sailing, exploring many islands, snorkeling. You all took such good care of us. Donald is a skilled sailor, diver, magician and story teller. Audrey is the best, most amazing chef, every meal was better than the last. Dennis was so attentive and fun. We had so much fun! I cannot wait to return. Hat’s off to the Nenne crew! Top Notch! We truly enjoyed out week in the BVIs. Your team was so kind, fun and accommodating. It was “Four Seasons” treatment and pampering. Donald – Thank you for sharing your knowledge about the BVIs and keeping us away from rain and rough waters. Audrey – You are an amazing chef, we enjoyed every meal! Dennis – you are a hard worker and have a great attitude. So polite and helpful, always with a smile on your face. A pleasure! First class service! We truly enjoyed our week and thank you for your amazing hospitality! 27th Jan to 3rd Feb, 2018 ~ Virgin Islands ~ Unbeatable! Wow! What an amazing week! It flew past sooooo fast ☹ Donald, your stories are always so fun and fresh. Sometimes even weeks later, we are still laughing. Audrey, you take such great care of all of us. Every morning with a smile and a day full of amazing creations (yum!) Together the two of you are unbeatable! And I’m so happy to be friends all year! How is it possible to have another amazing trip? Of course, you have done it again! The food, drinks, laughter and adventure were all perfect. We hope you are able to join us in the states, so we can take care of you for once. I know our paths will cross again. Thank you for everything! Thank you so much for the wonderful week, loved, loved it (again). Donald thank you for the snorkeling, it was great. Audrey thank you for the great meals. We will miss you. Thank you so much for such wonderful hospitality. You continue to impress us with all that you do for us. You truly are like family. We look forward to seeing again. Safe travels to you! This past week spent with my brother and family, and with you three has been one of the best weeks I’ve ever had! You all did everything possible to make sure every detail was taken care of. The food was incredible! (Audrey, maybe, just maybe I will be inspired to cook again!) Donald, you kept us laughing and took care of making sure we were entertained and safe – all at the same time. Richard, you noticed everything that needed doing and it’s done before anyone knows it needed doing! Thank you all for an incredible experience. Next time I know I still won’t dive but I will be an experienced snorkeler – oops – I mean “professional”! Please let me know if you are in Atlanta or Colorado any time! We would love for you to visit! And I do hope to be back on your boat again! You’re the 3 most awesome professionals I’ve ever had the privilege to know! You may not know this, but we have talked about doing this trip for 30 years! Life & responsibilities got complicated and we’re just now realizing this dream. And now that it’s over, I can’t believe what we’ve been missing all these years! You three are amazing, each setting the bar so high in your very different rolls. Donald – you are most definitely “the most interesting man in the world” with your vast knowledge of virtually every topic covered this week, not to mention keeping us all laughing the whole week! Audrey – good grief the food was amazing down to the very last detail. I will be thinking about almost every dish you made for quite awhile, and wishing I could just eat at “Audrey’s” again someday. Richard - what can I say? You are the man filling needs before they are even recognized as a need. And you have the most gracious spirit about you. A joy to be around!! You three will see this family again someday! Thank you so much for the best week EVER! Here’s wishing you 3 a lovely break followed by an amazing rest of 2018 with your individual lives and your charters. Being in the “service business” all my professional life, I know what it means to “delight” one’s customers. You 3 went beyond the “delight” the customer many times that these families have decided you are “professional delighters”. Seriously, you made all aspects of our trip so fun, easy, varied, relaxing and meanwhile….a trip that we4 will not forget. I really appreciate you and we hope/plan to see you in the next 2 years. P.S. Thanks for getting my wife and I remarried…that was not in the brochure! It is hard to put into words how incredible these past 7 days have been! Donald, thank you for the continuous belly laughs, getting us all scuba certified and sailing us around the BVIs! Audrey – no words. Your artistry and creativity with food is so enjoyable, as well as your sweet & caring spirit. Richard, you are the man! Thank you for being an incredible host who always had a smile on your face! The three of you are a dynamic and incredible team. I honestly had as much fun getting to know ya’ll as much as the trip. If you are ever near Portland, OR please visit. Josh and I would love to host you. We will be seeing you guys again! Thank you for making this trip unforgettable. No matter where life takes us, you will always be a part of some of our best memories. I am personally anticipating some new, exciting and good things for 2018 and your kindness, service and selflessness was the first of these things – thank you. I can’t put into words what an unbelievable experience this last week was for all of us. All of you went above and beyond on every aspect of the trip and we can’t thank you enough! Aside from the incredible food, stories and adventures we will value the friendship that we have found and will run into you all in the future. You are all so genuine and it was the human, relational part of the trip that made it unforgettable for me. Audrey, continue to keep “Captain Don” in check! Hope to see all of you soon. I thank every single one of you for the greatest, most relaxing, and energizing weeks of my life. This was an unbelievable trip filled with absolutely unforgettable memories & experiences. It’s funny to think back how short, yet long this week lasted. The “personal” aspect that each one of you brought to the trip is what made the trip so special to me. Keep providing incredible experiences to everyone blessed enough to take this week. Richard, keep eating cereal bud. It’s the best food category by far! I hope to see all of you soon. December 27, 2017 – January 4, 2018 – Family New Year Charter - Truly First Class! WHAT a trip! We had such a blast out on the Nenne, certainly no something this group will forget. Audrey, OMG your food – let me know as soon as you release a cookbook. Despite all the healthy options, I’ve eaten enough of everything to put on 10 lbs. Donald – your jokes are almost as good (read: bad) as Bruce’s…kept us laughing the whole trip. And Richard, amazing drinks/hospitality/literally everything else required on the boat. Plus, what a phenomenal G-Easy rap star quality. I hope we can come back and sail again with you three soon! ~~~~~~~~~~~~~~~~~~~~~~~~~~~~~~~~~~~~~~~~~~~~~~~~~~~~~~~~~~~~~~~~~~~~~~~~~~~~~~~~~~~~~~~~~~~~~~~~~~~~~~You made this week on of the best in my life. Totally truly first class, amazingly attentive and looked out for every need. Thank you for being such great loving people. The world need more people like you. Thank you for making me feel welcome and having my back. Thank you for the best week ever. You all really out did yourselves. I will be singing Business Time for years to come. Thanks for the incredible diving, meals, drinks & most importantly, shooters! Here’s to the best 2018! I came aboard with fears of claustrophobia and boredom. Boy, was I wrong!! Thank you for pampering me in ways I could not imagine and for teaching me to slow down and relax again! This has been the vacation to top all the others! The food has been incredible, and each meal anticipated with joy. Audrey, you are amazing! Donald, you are an amazing captain and all-around jokester/host! Thank you for all the humor and fun. Richard, you are such a great bar tender and non-stop host! Thank you for all the kindness and smiles. It’s been memorable, can’t wait to come back. We had the best time on our first week long sail. We will be back for sure! Every meal was amazing, drinks were always flowing and activities a plenty. We will absolutely be back for another amazing adventure! P.S. I would LOVE any recipes you are willing to share. This has been one of the best weeks I have had and I owe it to you guys! Your knowledge of this part of the world has made me so envious. Audrey, I appreciate your cooking me separate meals every day. I love every one! You have made this the most amazing rip. I cannot thank you enough for this wonderful experience. I have never felt so pampered. You are the best! How incredibly lucky are we two be the guests who get to kick off the charter life of the Nenne. From the amazing gift of Donald’s getting one of us to scuba, to Richard’s careful care of our every whim & Audrey’s incredible food and gracious hostessing. Thank you! What a truly beautiful Christmas! I can’t begin to describe how incredibly awesome the past 10 days have been. The drink, snorkeling, food, sling shot….just too much to list. Getting to know Audrey, Donald and Richard was a bonus to an absolutely wonderful escape. This was the best vacation ever! How fun it was to have you are our crew. Oh, and Audrey’s meals, Donald’s scuba diving, Richard’s snorkeling. Thank you! Thank you for being really nice and taking us scuba diving and sling shotting us! I really enjoyed this trip, wish I could stay longer. Hopefully we can come back again! 12 – 19 July 2017 - 43rd Wedding Anniversary! One of the finest weeks of our lives spent with our children while celebrating our 43rd wedding anniversary. Captain Donald, Audrey and Richard made it truly special! I cannot say enough about their hospitality, expertise and skills making this truly a family experience to remember forever. The food was sensational! A must to repeat….. soon! Thank you! Thank you for a wonderful week! We have had a blast seeing all there is to see and do in the British Virgin Islands. Thanks for all the special attention towards my son. He will remember this trip forever. Also thanks for all the delicious food and all the chicken cooked all week  The ship was beautiful, but our experiences were made by the careful attention of the crew. Thanks for a wonderful vacation! Thank you so much for the great week we had in the BVI. You are a fantastic captain, the food was amazing and the attention to detail by you and your crew was second to none. All of the activities you suggested were perfect for our family and our vacation. 01 – 08 July 2017 ~ A Fabulous Vacation! We can’t say enough about our past week! You guys went above and beyond to make our family trip unforgettable. If you are ever in the US, “It’s just a short trip to Alabama ” Cheers to you! Thanks for bringing our family together for a fabulous vacation! We can’t imagine a better crew - ya’ll are the best! Everything has exceeded our expectations! The food, service and activities were over the top – we can’t wait to travel with ya’ll again! Thank you for an amazing trip! I had so much fun! Maybe next time I’ll jump captain, more …. You and your crew, Audrey and Richard are an inspiration! “In a blink of an eye”! 18 - 25 June 2017 - Incredible Memories!! 5 Charters in and everything keeps getting better. You are truly family to us, and we look forward to next year with you in the BVI. The conversation, food, service, sights, experiences (boom jumps,scooters, dives, lost maps, early bedtimes), laughs and indelible memories will be cherished forever. Till next time, be well, my friends. This is not a goodbye… it is till I see you again. Love you all! Thank you for another fabulous holiday. I enjoyed all of your new creations, Audrey and all of the dives, Donald and wonderful cocktails, Richard. Thank you for all the new memories. Until next time. Donald, thank you for the amazing experiences on this trip! You never seem to disappoint! (I am jealous of your drone). Audrey, thank you for all of the delicious food! I think that the Tropical Chicken Salad is still my favorite. Richard, if I ever decide to pop around to South Africa, I will be sure to message you. By the way, I will dominate you in any game of your choice! Thank you for another amazing vacation. I had so much fun doing the dives, jumps and the scooters! I will miss you and can’t wait to see you again! 10 – 16 June 2017 ~ Outstanding!! Our journey with you over the last week has been outstanding! The memories created will last a lifetime and leave us boarding the plane back to Maryland with a plan for the next trip! For me there is nothing better in life to watch my husband and boys laugh and smile together. You all certainly made that happen … 5 stars! The amazing creative food, never ending cocktails, scuba, snorkeling, map briefings and great jokes and tales along the way … As I’m sure you three sit back and observe “this” crew, we also did the same. Each of you is a key element to the success of this wonderful vacation. Donald –thank you for your vast knowledge of the sea and worldly wisdom and whit. Audrey – thank you for the amazing gift of planning and preparing excellent cuisine that met and far exceeded our expectations. Your attention to detail did not go unnoticed. Richard – you will go very far in life … your smile, drive to work hard and constant ability to make us all new libations … so fun! Enjoy your journey. So fair well for now – until we meet again! If ever near DC, please don’t hesitate to call and look us up. All our best. Where to start? Thank you, thank you for one of the most wonderful vacations! Your care for us and your attention to detail was just perfect! Donald – all the adventures you planned for us were a blast. Your knowledge about the different dives and the Baths made the experience that much better. Taking us to Foxy’s (and meeting him! ), Willy T’s (Diving and jumping off) and Soggy Dollar were perfect Hot Spots. Your smile,energy and enthusiasm were infectious. Audrey – every meal was perfectly planned and so very delicious. Thank you for taking such good care of us this week. You made us feel more like family than just guests. Please call us when you are in Florida so we can meet for drinks and a little reunion. And Richard – thank you for all you did to make our vacation perfect! Keeping us hydrated or “double parked”, you are the best! Until we meet again! 27 May – 03 June 2017 ~ Wow, wow, wow!!!!!! Wow! What a vacation. How did we get so lucky to get you as our crew?? I have done the BVI vacation with another outfit. It was good – but you put them to shame. In a sentence … above and beyond. It is so clear to me that you all have worked to exceed our expectations. Thank you for that. While you didn’t get to see that side of it,you had a bunch of stressed out people on board. It melted away at minute one with the welcome aboard. Thank you for pulling off the ultimate Disney for adults. Richard, you are a lovely young man with a killer smile. You will go far in life. Ya’ll are welcome ANYTIME in Texas. I am confident we will see you again in the near future. Wow, wow, wow!!!!!! Words cannot express how this venture has been and will be one of the most amazing, spectacular vacations of our lives … bucket-list for sure!! Donald – thanks for the adventures, stories and laughter. Audrey – thanks for your amazing food, every meal. Richard – best dark and stormy maker ever! We look forward to being one of your repeat clients! Thank you for the best vacation EVER! We have never been so sad to leave a place. The diving, sailing, sling-shotting and sight-seeing were absolutely amazing, but they are nothing compared to the welcome, conversation and fun we shared with you all! Thank you, Donald for the patience, guidance and wisdom during our scuba training sessions; to Audrey for the incredible food and never letting us even THINK about being hungry; to Richard for the awesome drinks and the incredibly hard work you put into making us feel at home. We hope to see you all again sometime soon! How to say thank you for one of the best weeks of our lives? We’re not quite sure. Thank you for the many meals, the many laughs, and the many memories; thank you for each of the times you looked out for us and noticed a want or need we had that we didn’t even realize. Donald – thank you for daring me to be bold. Audrey – thank you for all of the special meals you made for me, pescatarian special. Richard – thank you for making me feel totally welcome in a very new environment. Thanks for the best, best, best week! Thank you for making such a special week into an amazing one! Your care, enthusiasm, fun, food, drinks and jokes! were all fantastic. You made our “family” week one that we’ll remember with great affection all our lives. So many happy memories. Thank you!! Best week of my life! Thank you for making this week so special for us. Donald, thank you for the sailing, snorkeling, wakeboarding and all of the jokes! Audrey, thank you for all the delicious food – and with no calories?! Rich, thank you for all of the drinks and just for taking care of me all week! Thank you again! Thank you for such an amazing experience and for being such fun and kind hosts. It has been an incredible week, the boat, food, experiences and company have exceeded expectations. Donald has been hilarious. I hope I remember the jokes and card tricks! Audrey, the food has been delicious and Richard has been so kind and hard working! I hope we all stay in touch. Thank you for everything. Words fail me – how to describe such a wonderful memorable week under all your care! The amazing food, fantastic energy, looking after our every need. The fun, the laughter, the jokes, activities too numerous to mention,spectacular meal times (my clothes shrunk – how did that happen??) lol. Really big big thanks to you all for making this such a special holiday. I can only wish you much continued success. Wow! What an amazing week. We can’t thank you enough for making our trip so memorable! We might never be able to vacation any other way! We will definitely be booking another trip! A few highlights from the week, were the amazing food – thank you Audrey, the amazing drinks – thank you Richard, the belly laughs – thank you Donald, the board meeting, Bitter End yacht hike, fishing, swimming, snorkeling, tour of the Baths, dolphins at Willy T, back island tour of Peter Island, meeting Foxy’s,Painkillers at Soggy Dollar Bar, dancing on the Fly Bridge, unlimited drinks and memories that will last a lifetime! Thank you, thank you for everything –ya’ll have been the best!!! I don’t even know where to start – this trip has been amazing! 18months of anticipation and it was so worth it! My favourite times were spent actually on the boat and not the islands. Audrey – your meals were much better than any meal we could have gotten at any fancy restaurant. Donald – you were like watching a stand up comedy show – 24/7. Richard – you are still coming home with us, you just don’t know it yet. Thank you all for the wonderful service this week. We will be back hopefully sooner rather than later! What an incredible trip! Thank you so much for your expertise and perfect planning. Your stories and adventures you took us on, the laughs we shared and the incredible food and drinks all made for the best vacation. Thank you so much! Wow! This was my first ever live-aboard sailing trip, and you have truly set an astonishing bar for me! Our group of 8 has had an exceptional week under your care, and I have a huge list of friends at home who will be coming back! Thank you all for your phenomenal hospitality, and a lovely budding friendship! We are all hoping we will be able to host you one day if you can tear yourselves away for a visit to Canada. What a week! I literally had the best time of my life. I met some great new friends, renewed some old and spent time with family. Audrey, Donald and Richard, you were incredible! Clearly we all want to come back again as we aren’t able to take you home with us. Audrey, never again will we have a meal off the boat … ever! Please stay in touch! We will all miss you. 08-15 April 2017 ~ Another Fantastic Trip! We have had an amazing trip! Richard, we are so happy to have met you.You have a very kind heart. I’m sure you have inherited all your father’s best qualities! We wish you happiness. Donald and Audrey, my heart is heavy today.The first charter we spent with you – on the last day I hugged Audrey and said I don’t know if I will ever see you again. I know now we will always remain in contact. I feel we have made lifelong friendships with you both. So today, I won’t say goodbye – I’m saying – see you (soon) hopefully. We will miss you and think of you often as we remember these amazing memories we have made with the Dynamic Harpers! We love you guys! Next year, let’s meet in the BVI. Another year and so many new memories made! Thank you for another fantastic trip. The food was incredible; you have once again outdone yourself,Audrey! Richard, you took very good care of us! Donald, always the entertainer!We love you and miss you already. We truly cherish our time on the boat with our friends! Here’s to friendship and love! Until next time! We thought this was going to be a “once in a lifetime” trip, and each year we come back! It is an absolutely amazing trip, never to be forgotten! You both definitely fit right in our group, good or bad ϑ Till next time, Harpers –Cheers! Thank you so much for everything! Never in my wildest dreams would we have thought we would take a trip like this one. What a blessing to get this chance! We have a great group of friends we travel with and now we have three more great friends! 25 March- 01 April 2017 ~ A Wonderful Fun-Filled Trip! Again, another wonderful fun-filled trip with the three of you! You all make this vacation one of its own! We love your company and your concern for us. Thank you from the bottom of our hearts! Your passion, energy and zest for life is contagious! The adventures we had and the days filled with smiles and belly laughs, will be something we will never forget. We´ve had many wonderful travels, but this is our favourite! It is not just the location, but, because you all were here too! Thank you for sharing your stories and caring for us so well. We adore you! 11-18 March 2017 ~ Great Memories! Thank you so much for all the great times, amazing food and unsurpassed service, even today, as we are packing up to leave! Some memories: Audrey´s food the best in the Caribbean, hands down, delicious at every turn. Donald´s seemingly endless amount of talents: magic, diving, sailing, boat driving,local and global knowledge, humour and life experience. So impressive! Thank you for deciding to move here and start your nautical adventure! We are so appreciative of your time, talents and care! Richard, thank you for everything!You are also so impressive young, with such a bright future, yet, mature and so attuned to everything around you. You will go far! 26 February - 05 March 2017 ~ A Wonderful Birthday Week! When we boarded, we were clients. When we left, we were friends.Audrey, you cooked up a storm in the kitchen, all the while chatting away I enjoyed our girlie talks! You all shared so much of yourselves with us,generous in spirit and kindness. Donald with his stories, so varied and interesting, some tall ones that Audrey corrected. So much knowledge you have as a couple, well balanced and a terrific team. Never once did we watch TV or even read a book! Richard, you are just at the beginning of your career, but already we can see that you are a rising star. A gentle soul, don´t change and a good dancer too! Not once did we feel you were working for us, even though the service was outstanding just show what a good job you did. We loved teasing you at dinner, Audrey, singing: We love you, Audrey, oh yes, we do! We were here with friends we truly love and adore, to celebrate a 60thbirthday. You helped us create memories we will re-live and re-tell and re-call for many, many years to come. You have woven yourselves into the fabric of our minds, forever. We treasure the time we spend with our friends as we stay indifferent countries. At no time did we feel that you encroached on our precious moments. Thank you for a wonderful week, all our love! 18-24 February 2017 ~ Far Surpassed Any Expectations! What a wonderful time away we all had. It far surpassed any expectations we may have had, and will be the topic of choice when discussing our best memories for years to come. From the first time we stepped on deck, we were welcomed with open hearts. Donald and Audrey worked tirelessly to ensure we were always comfortable, entertained, and extremely well cared for and well-fed! We were so impressed with their level of professionalism and competence. They were always mindful of our children, whether it was looking out for their safety while playing with all the amazing toys, instructing and leading them in scuba diving, or just spending time entertaining them with Caribbean stories, history and card tricks! Of course, the kids enjoyed their time with Richard as well,who made our stay so comfortable, they were wishing he would come home with us!! The boat itself is lovely and modern. It was meticulously kept and very comfortable for our large family of 7. There´s just something so relaxing about being gently rocked to sleep each night! July 14 - 21, 2016 ~ Our 4th Charter with the Harpers! What can we say?? This is our 4th charter with The Harpers, and every time the experience is better and more enjoyable than the charter before. You are not just crew; you are our second family, our Caribbean Soul Mates! The highlights for us are: the succulent food, the indescribably beautiful views,water colors and anchorages, the spectacular yacht(crystal wine glasses, huge master bedroom all the comforts of home. Simply a regal vessel! ), the stories, conversations and many laughs! This is undoubtedly our favorite type of vacation, and we hope to share many charters with you in the future. June 25 - July 2, 2016 - Virgin Islands ~ Ship of Dreams! Thank you so much for making our trip so enjoyable! You were all so kind and were sure to check that we were having the best time ever in the BVI. I now know that Donald has the best stories and is an amazing hiker, Audrey is an amazing cook and Caitlin is so good at Celebrity. I really enjoyed being on the boat and thank you again. Keep me in the loop! Thank you so much for sharing magic tricks all hours of the day,serving 5 star meals, making a mean cocktail, and for waking me up when I fell asleep tanning! Most importantly, thank you for being an amazing family! Thank you all so much for making this holiday so special. A perfect birthday gift, surpassing all our expectations. Donald - thank you for planning such great activities for all of us. And for keeping us entertained with your stories and jokes. Audrey - thank you for the most delicious meals and exquisite presentation. You have inspired me! (please send recipes) Caitlin - thank you for looking after us so incredibly well. Always around to assist us and thinking ahead of our every need. You totally spoiled us. Thank you for being a fantastic team. Together you kept us safe,entertained and relaxed. So, so many great memories for us to share with our friends. Please come and visit; London, Aspen, Saint Andrews, LA. We will never forget the special holiday with you. Safe sailing down south. Thank you and we wish you all the very best. Well, I haven´t had this much fun since I met Enema Sanchez A Gogo (TheConquerer) some years ago. Every moment was magical and I will always remember this trip as the best one ever. All of you are so competent, so much fun and so good natured that even Enema could find nothing to fault had she been able to join us :-) Who knows, we might come do this again. All the best and safe sailing. What a special trip, so many beautiful places. Outrageous fun to be had. Donald is like a big kid, always willing to have fun and make the best of every situation. BVI will be in memory for ever. Beating my twin brother on a wakeboard, doing a 180 degree board slide. Way to make my Dads 60th a meaningful one. Awesome crew with great personalities. Hopefully we can comeback in the future to have some more shenanigans. Safe travels. Thank you so much for providing all the essentials for us to have an amazing trip! The food was delicious, the service was speedy, the activities were so much fun and the jokes/stories were fascinating! I am so glad we got to share these memories with you all! I hope we can all meet again!! Wow! What a trip! You guys are truly unbelievable. Caitlin´s charm and hard work, Donald´s hilarious stories and lastly Audrey´s incredible food.Because of you all this has to have been the best vacation of my life. So thank you guys and I hope to come back soon, thanks for the fun times. June 13-20, 2016 Virgin Islands ~ We loved it!! From the minute you greeted us on the dock we knew we were going to have a wonderful vacation. The warm welcome, gor11geous boat and delightful hospitality exceeded our expectations and only got better and better each day.Thank you for giving us an amazing week for our family and friends to truly relax and create such beautiful memories together. The Caribbean is a very beautiful place to explore and enjoy but what made our vacation so special was the happy and joyful feeling we all felt in your company. We hope to plan another vacation with you again in the future and really hope that if you ever make it to California, you will stop in to visit us. Thank you again for treating us to such a wonderful vacation, one that we will always remember! We have had a host of superlatives on this trip from the spectacular boat, pristine environment, perfect weather, fun, excitement, activities, meals and it goes on. But, the best of the best was you three! You kept us safe,entertained with Donald´s great stories and Audrey´s truth serum for Donald. The food was perfect; Caitlin´s service was exquisite and her sweet voice unforgettable. Most of all, your stories and lives taught our children and us the value of being virtuous and following your dream. I thank you for everything and mostly for that. I hope we meet again. What a wonderful week! Thank you for giving us such a fabulous holiday!We enjoyed every minute of it. You spoiled us rotten and it is going to be so hard to go home to normal life. The food was amazing, activities were so fun,the boat was perfect, and we love that we made three new friends. We would love to have you come visit us in California! Looking forward to another boat trip in our future. God bless. Difficult to express how much we enjoyed the week. You are a very special family. More than just our hosts providing an excellent boating week,you brought us into your lives with extraordinary wit, wisdom and good humor.You´re also so generous and patient. Thanks for a special, memorable week. All of you made this trip as amazing as it was! I loved everything from your five star service and amazing food to Donald´s super cool stories. This truly was my favourite vacation, all thanks to you. Thank you so much. Thank you for going above and beyond to make this vacation an unforgettable one! I am definitely going to miss the delicious food, hilarious stories, and super fun adventures. It is admirable and inspiring that you were able to leave your home and do something that truly makes you happy. Hopefully we will go on another boat trip together soon! Sincerely. It has been my dream for a while to explore the Caribbean. Thank you so much for making this experience exceed all my expectations (which weren´t low to begin with). You guys have truly made this vacation one I will never forget!Donald was talking about how life is just an accumulation of all your experiences. This experience was truly a special one and the best week of my life so far. One of my favourite parts of the trip was listening to all your guys crazy, exciting and funny experiences. I wish all of you the best and hopefully this isn´t the last time we see each other. Thanks again. Thank you for such an unbelievably amazing week. I have been fortunate to have had a few really amazing vacations and trips, but I can absolutely say that the quality of service you three provided is the finest I have ever experienced. Your combination of friendly, welcoming, and beautifully humble personalities really set you apart from other hosts. You guys made us feel so welcome, so comfortable, and we were delighted to spend our week with you. We will miss you and the beautiful sailboat so much! What can we say? We loved our experience so much the first time we had to come back! Thank you for everything. We are hoping to see yall in the near future. Love to all of you! We had a wonderful trip! Thank you (again) for making it so memorable!Also, thank you for making it so great for the children! Thank you for the wonderful experience. Every aspect was enjoyable and stress free. Y´all made the week fly by. The tours were fun, food was awesome and the service was delightful. We had a blast and enjoyed seeing y´all again! Our first time on a boat and you set the bar very high!! Thank you all so much for a wonderful experience. Hope to see you in Texas in the future. We will get the smoker fired up and cork some wine! May 10-16 2016 ~ Amazing Vacation! We shared a few pictures of our trip with some close friends back home and their comment was I wouldn´t want to come back home. So guess what: We do not want to come back home! The pictures are beautiful indeed, but what they do not capture is the magic you three create in your own very special ways. Lets start with your lovely South African accent we always personally loved. Your smiles at all times that indicate you love what you do and how you do it is untouchable. The days are long and yet it is continually filled with laughter,kindness, attention and supreme service. You all make it look effortless yet we all know it is anything but! Your talents and skills are unmatched, yet you hearts define it all. Donald, your humor, knowledge and caring presence were an ultimate treat for us. Audrey, you continue to turn up delicious meals day after day in a 3 by 6 kitchen! Now that is talent! Caitlin, the hard working girl that isn´t afraid to roll up her sleeves under any and all circumstances.You do it with pride, heart and incredible charm. We will forever remember you and our magical journey. Dreams are seldom surpassed by reality but you three did just that! All our love! Thank you so much for giving us a vacation that will be a treasured memory for a lifetime. You went above and beyond in serving us and meeting every need or want we had. Thank you for sharing your incredible talents of cooking, table setting, diving, finding pirate treasure, singing, decorating and making us feel at home! Thank you so much for your hospitality, your kindness towards all of our kiddos and for loving our family so well! We have waited for 20 years for this family holiday and you all made it truly worth the wait! Couldn´t be better!!!! Just heaven. Both crew and boat beyond my highest expectations!!! Jan 6-13, 1016 ~ Floating 5-Star Hotel ! Thank you Donald, Audrey and Caitlin, for a truly unforgettable time on the boat, water and shore. Your crews passion, enthusiasm and joy for the boa tand your guests create a fantastic atmosphere onboard with the perfect blend of excitement, laughter and relaxation. Donald, your experience and people skills are invaluable and make the trip into what it was. Audrey, your cooking made every meal a feast and something to look forward to. Caitlin, your helpful and very friendly attitude made us feel like we were in the worlds tiniest,floating 5-star hotel. You guys make an incredible crew and set the bar for holidays on water incredibly high. Thank you all and we wish you all the best for your future trips. We would love to join you once again! Dec 27-Jan 3, 2016 ~ Trip of a Lifetime!! Dear Donald, Audrey and Caitlin Thank you for doing such an amazing job of showing our family your little piece of paradise. We knew this would be a trip of a lifetime, but we had no idea how the three of you could make an unforgettable trip even more amazing. The adventures, the food, the service,the great stories and laughter and most of all the kindness that you so effortlessly provided were above and beyond. Thank you for everything! We truly hope our paths cross again sometime. You made our family vacation absolutely sensational! Your hospitality,humor, educational moments, excursions were only some of the highlights!! The boys enjoyed all of the activities. Learning to Scuba dive was truly something will remember forever. You both didn´t miss a trick .... We can´t thank you enough. I am excited to share recipes with you. It was unbelievable how you were able to make one meal better than the next. Charlie´s pirate experience was wonderful. Watching his excitement made the voyage even more fun. Eric enjoyed every water activity and we had such pleasure watching Bryan being so relaxed,which was needed. They all enjoyed learning to sail. Mark is now an expert at grabbing the pick up buoy. My in-laws haven´t stopped raving about it all. We were strangers at the beginning of the week and have now become friends for life. We are looking forward to seeing you again. What a sincere pleasure to have the privilege to sail with you for a week in the BVI. You are such a delightful couple who have made us feel like we are your family. Don´s humor and quick wit kept us all entertained. Then he would show us his extreme knowledge on many subjects - especially the stargazing. And Audrey absolutely amazed us with some of the most delicious and beautiful presentations at breakfast, lunch and dinner. And her smile and charm always complimented each meal. Together as Captain and First Mate they are an unbeatable team. We thank them for one of the most enjoyable and amazing weeks.Absolutely the best!!! Over the top! Didn´t know it could get this good! Thank you for giving of yourselves all day and night. Your stamina was remarkable. Your personal stories were extraordinary. How can two people have this much humor and this much wisdom and knowledge? Thank you dear friends, may we do it again and again! You helped bring my family together in a way other vacations simply could not. Thank you for seven adventure-packed days of snorkeling, scuba, jumping, hiking, kayaking, kneeboarding, etc... and also laughs, magic tricks, delicious food, engaging stories and impeccable service. We consider you friends and comrades, and we look forward to our next holiday together onboard Aletheia. Thank you for a truly unforgettable and heavenly experience. Our voyage with you this week was just spectacular! Both of you are models of THE BEST host and hostess. We had a wonderful time snorkeling, laughing, fishing, sailing, our tour of the Baths, our fun in the Bubbly Pool, the absolutely gourmet, healthy, fresh, fabulous meals! What a trip to remember! Thank you for your wonderful, caring hospitality. We will always treasure this week. Thank you! You are the THE BEST! We look forward to our next sail with both of you! Felt like family to crew upon arriving on boat. The best! Our comfort was their priority. Huge congratulations on finding such a very gracious, courteous, easy and open minded crew. We had the best ever service. Whatever we wanted to do, they were on top of it. Top notch, on top of everything. Crew bent over backwards to meet all of our needs. Can’t imagine this crew ever being short on fun. Many activities engaged at every level. Over the top great. Could not imagine having more fun with 3 people we’ve never met before. Like family – but the good ones! The Captain and crew were expert at everything: scuba diving, sailing, food, making sure guests are having fun. They know the islands, where to go & what to see. Diver Instructor a HUGE plus. Extremely knowledgeable in regards to all aspects of our trip. Audrey is an excellent chef. All meals above and beyond what we expected. Never had better! Loved everything. Best meals we’ve ever had on vacation. NOT just a couple meals, every one of them was awesome. We discussed the best meal while on board and we all found it difficult to single out just one. Audrey should be cooking in a 5 star restaurant! The meal presentations were awesome, such a delight. 5 star! Great! We would charter this yacht again and again and again. Was a perfect vacation. The locations and choices for stops were great. We had a great mix of private relaxing beaches, quick tours, snorkeling and party days. The food was incredible. Meals and drinks were perfect. Great variety and never needed anything different. Perhaps the best two highlights go hand in hand. First being the amazing crew. Tough to call them a crew because they were part of the experience more than being the crew. Fun to be around, experts at what they do, helped with every want or need. All three [crew members onboard]. Couldn´t imagine the trip without them. Second highlight because they were so amazing, it was the first vacation (and perhaps first week of adult life) we really didn´t have to make any decisions. It was all taken care of by Donald, Audrey and Kyle. All in all - the best vacation ever - hands down. Honestly, I can say this was one of, if not the, best trips of my life. Donald, Audrey and Kyle did such a fabulous time of making sure that our entire group truly relaxed and entertained! From the food, the activities and the sites we saw - it was just amazing! Most times on vacation - by the end people are ready to go home, but not on this one.